2. pour the dark liquids over them. 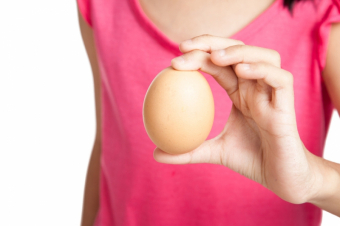 Allow the eggs to sit in their liquids for the day, checking them periodically, and then over night. 3. At the start of the experiment, talk with your children about what they think these liquids will do to the hard white shells of the eggs. Show them how, even after a few minutes, the eggs in the dark liquid becomes discoloured. 4. Periodically throughout the day and again the next morning, look at the eggs and discuss how the liquids are staining the eggs, and how they might do the same to teeth. 5. Show the children how they can use the toothbrush and toothpaste to gently clean the eggs. This will demonstrate how good oral hygiene can help protect our teeth from damage and even reverse damage. 6. Have the children brush the whole surface of the egg gently. Emphasize that when brushing their teeth, they need make sure they brush all the surfaces of each tooth so that every spot gets cleaned. Ask them to imagine that the brown stains on the eggs are dental plaque that they have to brush away with their toothbrushes! Teaching children about oral health and preparing them to visit the dentist can be fun! Check out our other oral health resources here, or get in touch for more advice.